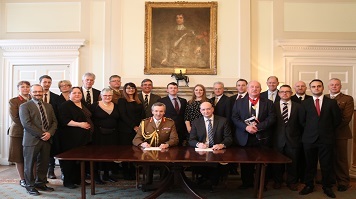 London South Bank University (LSBU) has this month (22 February 2017) signed the Armed Forces Covenant (AFC) to commit to supporting the armed forces community, in a private ceremony at Horse Guards Barracks, Whitehall, attended by students, alumni and staff from the University. Signing the AFC represents a firm commitment by LSBU to supporting the armed forces community, by recognising the value of staff and students who are serving personnel - both regular members and reservists, veterans and military families - and their contribution to British business and the security of the country. Attending the signing of the Covenant were Professor David Phoenix, Vice-Chancellor of LSBU, Major General Ben Bathurst, Councillor Charlie Smith, Deputy Mayor of Southwark and Professor Paul Ivey from LSBU, who managed the project over a six-month period. The Armed Forces Covenant operates as a tiered system with Bronze, Silver and Gold award classifications. The level of the achievement acknowledges the amount of support an organisation has demonstrated in supporting the needs of the military community. Speaking at the event, Prof. Phoenix said: “From a standing start, in just six months, 50 LSBU students have shown an interest to engaging further and 15 staff who have served, or are reservists, or have an existing relationship with Armed Forces – are helping to shape our future commitment. Professor Paul Ivey, Pro Vice-Chancellor at LSBU said, “This is a big day for LSBU as it is the first time the University has formally pledged its support for the Covenant. LSBU is now looking forward to a long and fruitful working relationship with our Armed Forces Community. If you are interested in being involved in our work on the Armed Forces Covenant, please send us an email. We are currently setting up a staff and student network and would welcome an interest from anybody that would like to engage with us.